With the advent of newer technology and the increasing cost structure of center-based hemodialysis therapy, home hemodialysis is likely to become more prevalent. Thus, the physician managing vascular access will need to be cognizant of the specifics of hemodialysis at home. 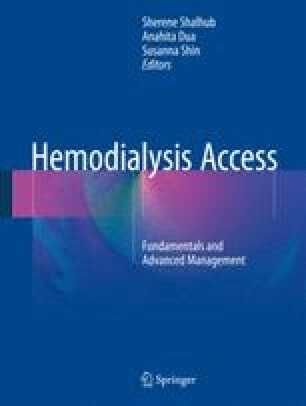 This chapter will focus on the differences between center-based dialysis and home hemodialysis and discuss self-cannulation principles and ergonomics, changes in dialysis frequency and length, and clinical monitoring of the access from a remote location. United States Food and Drug Administration 510(k) summary K070049. http://www.accessdata.fda.gov/cdrh_docs/pdf7/K070049.pdf. 3 Feb 2011. United States Food and Drug Administration 510(k) summary K050525. http://www.accessdata.fda.gov/cdrh_docs/pdf5/K050525.pdf. 24 June 2005.